Vancouver has turned against me. Oh yes, last week it was all romance and sunshine, cherry blossoms and daffodils. But now, it seems that one or two among the vast array of plants I’ve been enjoying has sent little bits of itself to bind to the antibody on my mast cells, causing a histamine release. Yes, I am allergic to beautiful Vancouver. I have discovered that when you live in a different place, allergies can have different symptoms. I didn’t realize my main symptom until two people in two days told me I looked tired. Argh. I hate hearing that. I wanted to protest, “But I’ve been getting a lot of sleep lately! And I don’t FEEL tired! My body is the temple of the Holy Spirit and I’m taking care of it, really I am!” Instead of saying that, I complained to Danice, who told me to disregard these people. The next day, after eight beautiful hours of sleep, I woke up, looked in the mirror, and I looked tired. “Danice, I look tired,” I said. She said the comments of others were going to my head. “No, really, I look tired.” She refused to comply. She’s not very perceptive. We’ve done a lot of research online for this, looking up geckos and iguanas and chameleons and frogs and newts and anoles and skinks and even giant lizards that don’t fit in tanks. Anything to procrastinate from doing real work. We’ve learned that a lot of them eat insects, a lot of them need heat lamps, and a lot of them give you salmonella. The turtle seems to be our best bet for staying alive and not costing us very much. The Wikipedia website at http://en.wikipedia.org/wiki/Pet was particularly helpful, telling us right off the bat that “A pet is an animal that is kept (mostly by humans) for companionship and enjoyment, as opposed to livestock, which are kept for economic reasons. The most popular are noted for their loyal or playful characteristics or their attractive appearance or song.” Ok, first of all, Wikipedia, did I read that correctly – “mostly by humans”? Mostly? I’m not sure about that. But Danice and I did agree on one thing… if our turtle isn’t loyal, playful, attractive or vocally extraordinary, we’re going to inform everyone who asks about our pet turtle that actually, it’s not a pet, it’s livestock, and we keep it in our home for economic reasons. Last night I went to an insanely amazing concert by a guy called Trace Bundy. He doesn’t sing, which is good, because instead of learning to sing, he just taught himself to play acoustic guitar in ways previously unknown to humankind. He sounds like three guitar players at once. He abandoned the pick years ago because he found out his fingers were way cooler than a piece of plastic. Some of his songs are entirely hammer-ons and pull-offs. He has one song where he intentionally clutters up the fingerboard with five capos just to introduce obstacles that give him a sense of challenge, and another where he’s constantly pulling off and putting on capos in the middle. If you don’t know guitar, or what a capo is, or how to pronounce it, just know that this guy damaged the egos of every guitar player in that room. You can check him out yourself at www.tracebundy.com , or wait for me to get home and show you the DVD. Which reminds me, as of tomorrow, I will officially be back in Saskatoon in one month. Crazy! I’m excited because Christine is coming to take me home, and we’ll get to ride on a plane together. And when I get home, my grandma will be there, and I haven’t seen her in five years! First, a couple papers to write, a lot of books to read, a few exams to knock off… and I’d better get over these allergies, because at this rate, you guys won’t even recognize me when I get home. P.S. This is my fiftieth post! Hooray! 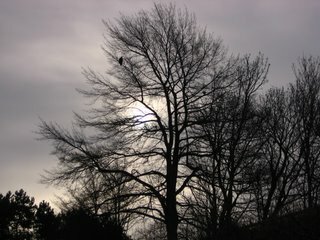 In honour of that, here is an eagle in a tree (he's at the top left).